On January 2nd, 2015, I volunteered to help with cooking, serving, and cleaning at the Saint James Church. 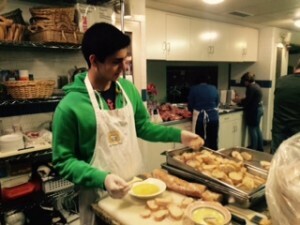 http://www.stjames.org/service/meal-programs/. This was my first out of school service done this year and it was very gratifying helping the homeless. We started by making food. We made shepard’s pie, salad, and brownies for the homeless. We then served all 75 of them. It was great seeing their eyes light up as we brought out the food. When serving them it felt gratifying looking at all of their happy faces seeing the fresh, delicious food. After everybody was finished with their food, we took their plates and cleaned up. Helping the needy is a very gratifying experience, and I am definitely going to help here again. This entry was posted in Uncategorized and tagged Morris by 18madan. Bookmark the permalink. I’m pleased you had a good experience volunteering with Saint James Church meal program. I bet you were surprised by the numbers that turn out for a hot meal. I know you enjoyed being a part of the prep and service. I know that every Tuesday morning and Friday evening volunteers meet in the kitchen at St. James’ to prepare and serve a meal to more than 90 hungry and homeless guests. I have participated in their volunteer program several years ago and remember appreciating the way they receive their guests. They laid the tables with cloth, dinnerware and flatware.. Do they still place a vase of beautiful flowers as centerpieces on tables? As a volunteer, i was assigned to stand at the doorway and welcome each guest with a smile and greeting.